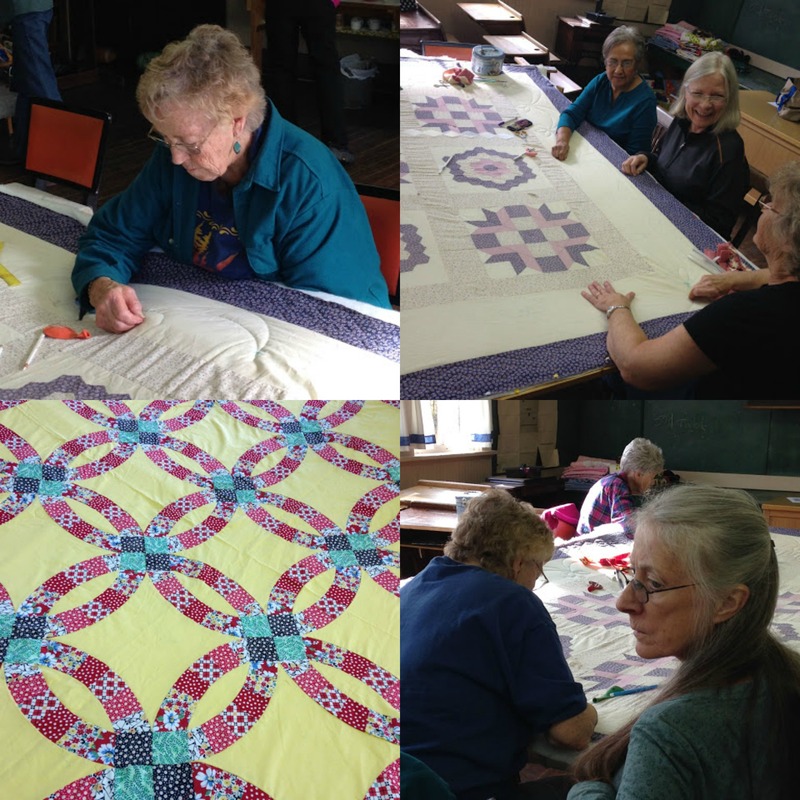 Every year we raffle off a quilt that we made in order to raise money for the Historical Village. This year’s is a beauty but than I probably always think that. But no – truly – this year’s is amazing. Not just the colors but th e amount of stitching. We like taking it out from the cupboard to show visitors. Even though we made it, we still marvel at the quality and quantity of the work. 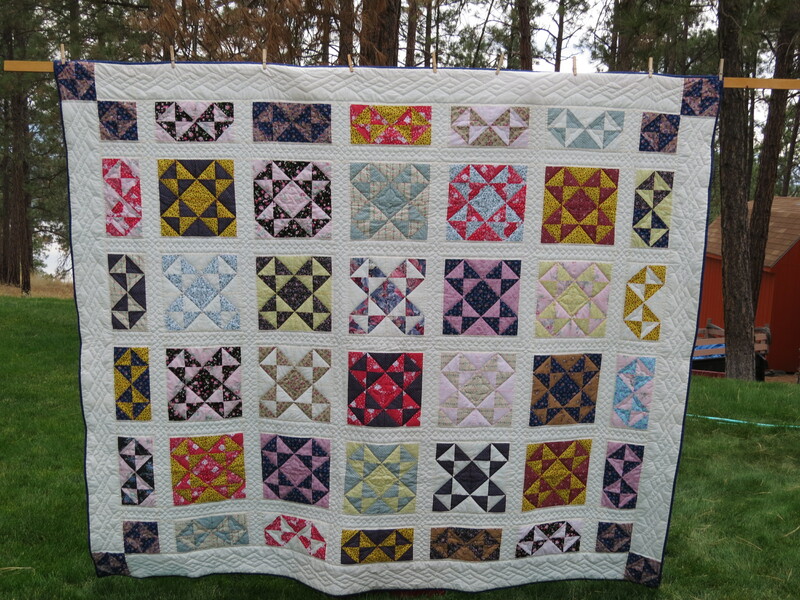 So now we are selling raffle tickets for this quilt and next summer at the Lincoln County Fair someone will win it. It could be you. Perhaps it seems too early in the game to be buying raffle tickets though for something that you might not own until next summer but think of it as an installment plan. If every month between now and late August you bought ten tickets, you would have one hundred chances to win. One hundred! And you wouldn’t hardly think about the money because its just $10/month and really that’s about three of those fancy coffee drinks. Wouldn’t you rather be snuggled up beneath this wondrous quilt than buzzed out on caffeine? Thank goodness for October. Today I went to quilting. There were nine of us there working on a quilt for Nikki. It is a top that her mother pieced many years ago and Nikki decided to have it finished. She stopped by today to have a look and take a few photos of the process. Cathryn w as her usual diplomatic self and expressed how much we were enjoying the fabric (a very soft cotton) and didn’t mention our grumbling as it had been difficult to sew the border as a result of the color and the quilting pattern that had been chosen. But we finished the border today and decided to set up a second quilt for next week. Once we begin rolling the ends of the quilt in, it limits how many of us can sew on it at one time. The new one we set up is this sprightly yellow pattern that is going to make someone’s bedroom lovely. The two quilts are so different in both their colors and their styles. It will be nice to have choices when we show up on Fridays. Everyone was so enthused to be back sewing together that we decided to have a celebratory luncheon at a new place in Fortine the last Friday of October. For me today was a reminder of time. Darla I(Nikki’s mom) pieced this quilt about thirty years ago. Now Nikki is pregnant with her first child and here we are finishing it up so it can be used. This quilt will easily span three generations. Of course there are quilts that have been in families longer than that. I look around the old school house. Many of the quilters here have grandchildren. Some even have great grandchildren. I wonder if the wisdom these women have is appreciated and passed down? I’ve no doubt this quilt will be cherished for years to come. I hope the wonder of these women is cherished as well.